The T-1100 is a successor model to the highly praised T-1000. Thanks to a blend of latest RF circuit design with sophisticated digital signal processing implemented by a high-speed, high-precision DSP chip, it has become possible to move most major functions of the tuner into the digital domain without sacrificing performance or sound quality. Audiophiles and music lovers can now enjoy FM stereo at its best. The newly developed front end features a double-tuned circuit that optimizes sensitivity and selectivity, as well as the revolutionary DDS (Direct Digital Synthesis) principle for the local oscillator. All functions after the intermediate frequency (IF) stage are implemented using digital signal processing in completely new and innovative ways. This comprises the variable bandwidth IF filter, multipath reduction function, digital FM detector and DS-DC stereo demodulator. 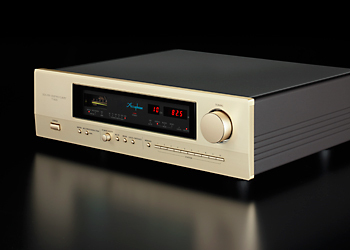 The result is an FM tuner unlike any other, offering further enhanced performance and sound quality.